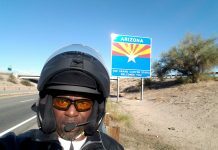 The highway can be quite intimating to the inexperience, especially when riding for extended durations on a motorcycle. There are many factors that come in to play, such as weather, fatigue, and even mechanical issues. Even the most experience rider will sometimes express the difficulty they encountered while riding long distances. But what about if you’re 16 years old? I mean, after all, as a sixteen year old female, you’re probably thinking of having your first boyfriend, maybe a school dance, crazy fads, or even graduating from high school soon. 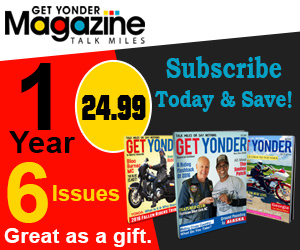 The last thing you would think of is riding motorcycles……unless of course…..it’s in your blood! Delshateki, known as Dirty Bird, has been surrounded by motorcycles all of her life. Her father, Big Hump (Sons of Solomon MC) and mother, Thunder Kat (President of Blaque Pearls MC) both introduced Dirty Bird to riding at a very early age. As an avid biker, her mom would ride to events with her on back, not wanting to exclude her from one of the things she loved. Dirty Bird enjoyed riding, however, often got bored, sometimes even falling asleep. She stated that she wanted to ride on her own, to prove to her mom that she could do it. 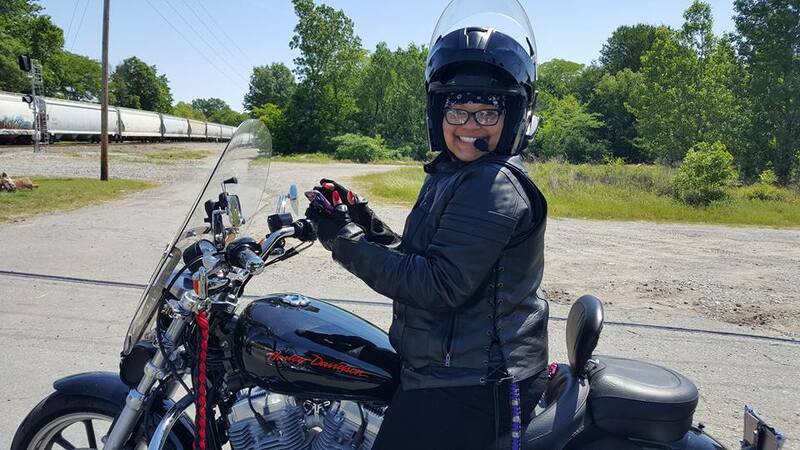 After receiving her driver’s license, her next goal was to obtain her motorcycle endorsement. On April 16, 2016 Dirty Bird received exactly what she needed. 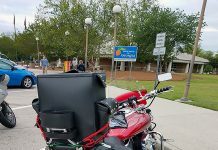 Her parents purchased a Harley Davidson 883 Sportster. 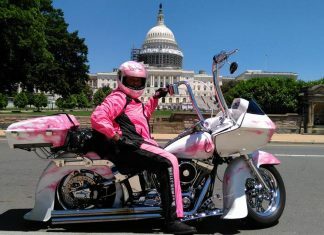 Her first official ride would be to Little Rock, Arkansas to celebrate International Female Ride Day. 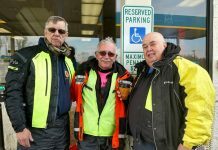 They would leave from Killeen, TX at 7:30 am with a group of women riders. Dirty Bird was excited, dressed in her leather jacket, leather boots, leather gloves and helmet. She and her mother both wore Sena Bluetooth communicators, to be able to talk to each other during the trip. It was important for Thunder Kat to be able to communicate with her at all times. They rode in a staggered formation, however, Thunder Kat rode in back to be sure that Dirty Bird was always in her sight. 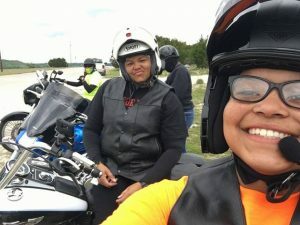 As her mom, she was also concerned that she would get tired due to not being conditioned prior to the ride, so they stopped every 100-110 miles. During the course of the trip, she would continually talk to Dirty Bird, via the communicators, ensuring she was fine. Dirty Bird stated that if she started to get tired, she would change the music that she listened to, however, if she felt “a long blink” she would let her mom know that she wanted to stop. I thought it was hilarious that she used “a long blink” to refer to her getting sleepy! However, she was able to successfully make the 7 hour trip with no issues. 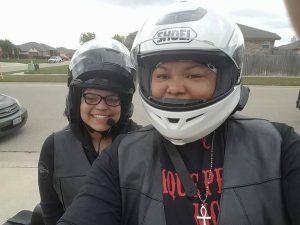 After indulging in the festivities for IFRD, two days later, the group of ladies headed back to Killeen, TX and once again, Dirty Bird held her own. On the trip back, the weather didn’t cooperate as they expected. She changed into her wet weather gear, and rode through the rain like a trooper. In addition to the rain, Dirty Bird had issues with one of the mirrors on her motorcycle. They stopped to tighten it, as it twirled with the wind, however, it eventually fell completely off while riding. 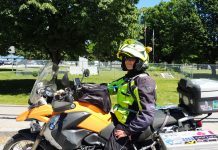 Her mom stepped in, using their Sena Bluetooth, advising her of any hazards and the vehicles that approached from behind. Needless to say, they made it back to Texas safely and Dirty Bird’s first trip was a success. Due to their trip being Mother’s Day weekend, Dirty Bird was a little upset that she didn’t get a chance to plan something special for her mom. She stated she had previously asked her dad for money to do something for her. However, once they arrived back home, her mom stated that it was the best Mother’s Day ever. It made Dirty Bird feel much better, even though she didn’t completely understand why it was such a big deal to her mom. As her mom, and a passionate biker, Thunder Kat was overjoyed that Dirty Bird was able to complete her first trip. 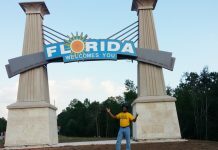 With her first trip now in the books, she is already planning her second trip, however, this one will be with her father. 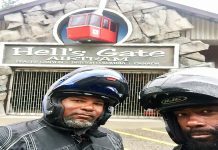 She shared, that the two will travel to Key West, Florida, riding to The Dragon in North Carolina, and finally to the state of New York, while visiting family along the way. Dirty Bird also expressed her happiness to be able to ride with her family, to include her older sister. She said it’s something that they can all share together, sorta like a family affair. I expressed to Dirty Bird, that the ride she took was no ordinary feat! The fact that she rode for 7 hours, one way, and it being her first time riding was amazing. I applauded her bravery, being in the 10th grade, and 16 years old. She continued to say that it wasn’t a big deal, and she was surprised at the response she received after the trip. She stated that she is glad to be apart of something that her family loves, and is happy that she doesn’t have to ride on the back, bored any longer! 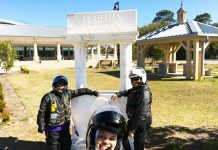 She Rode To 48 States!